Tattoos are permanent marks on your skin, and choosing to get one is a major decision. Do not attempt to give yourself a tattoo with an improvised tattoo machine like this one (sometimes called a "jail house rig"); use it only to practice the art of tattooing on a fruit or vegetable with a skin like an apple, banana or potato. If after practicing you decide you'd like to get a tattoo or become a tattoo artist, visit a professional and reputable tattoo shop. With a needle nose pliers, attach one end of an 11-gauge guitar string onto the moving blade of the electric hair clippers. You may need to remove the metal blade guard with a screwdriver first. On the side of the clippers opposite the side on which the guitar string is attached to the blade, glue or tape an empty ink tube from a Bic ballpoint pen so that it sticks out the side of the clippers. 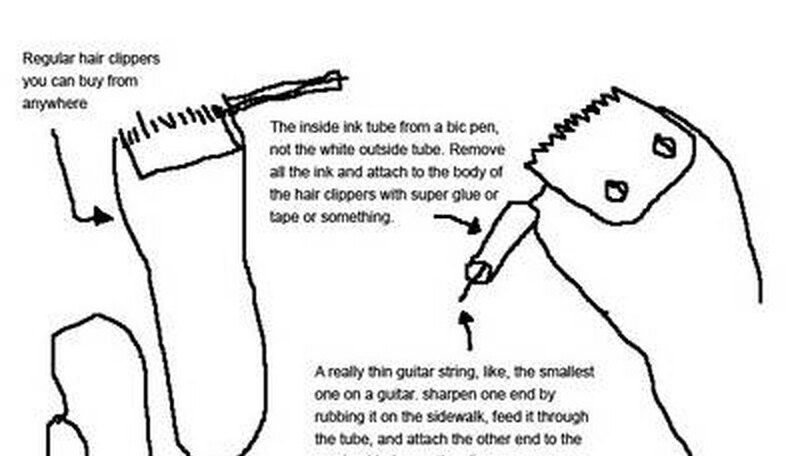 Thread the free end of the guitar string through the ink tube. The tube is meant to stabilize the needle. Cut the guitar string with the needlenose pliers at an angle to make it as sharp as possible; cut it short enough so that it is pulled into the empty ink tube then back out when the clippers are plugged in and turned on. Dip the guitar string/needle into ink, turn on the clippers, and practice tattooing on a banana, potato or other fruit/vegetable with skin. Use this improvised tattoo machine for practice on a fruit or vegetable only. The needle is not held in place securely, so it will vibrate back and forth. This means it cannot tattoo a clear line. Because this tattoo machine is homemade, you cannot control how deeply the needle penetrates whatever it is being pushed into (as you can a real tattoo gun). Therefore, the needle may not be able to puncture the skin deeply enough to create a well-made tattoo on human skin. Do not attempt to give yourself or another person a tattoo with this machine.